If you need support, give us a call on 0800 338 0414 between 6am and 6pm. For 25 years, we’ve helped all kinds of kiwi businesses get their IT and IT services spot-on. With our IT services we design, implement, manage and support everything you need to make your business a success. Hardware, software, networks, hosting, advice – the lot. And we do it all with a winning mix of moxie, creativity and charm. Takahe magazine is a non-profit literary magazine featuring the work of New Zealand writers, poets and artists. It contains more than 70 pages packed with the work of some of our country’s most creative talent. It looks beautiful on any reception table and it doesn’t date. Be uplifted, inspired and intrigued by the brilliance of your fellow Kiwis. Honeywrap was inspired by nature and a passion for making a difference by reducing the amount of plastic on the planet. Each beeswax wrap is made in NZ from GOTs certified organic cotton - they're reusable and eco-friendly and offer a natural alternative to plastic food wrap. Rethink products are environmentally conscious and easily incorporated into your busy everyday lifestyle. They make it a breeze for you to ditch old, single-use habits by using sustainable bags for your food storage and on-the-go needs. Rethink bags are Certified Organic and environmentally pure; designed for your convenience when shopping for fresh produce, bread and pick-and-mix. 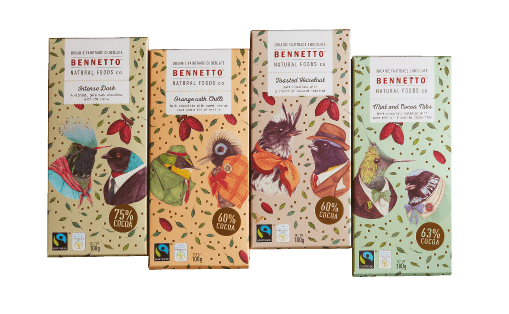 Bennetto is a small company in the big world of chocolate – but they’re pretty special. They thoughtfully care for every part of what we do. The secret to the quality of our chocolate has a lot to do with the ingredients. Bennetto uses only organic, and when able, Fairtrade certified. They never use refined white sugar and when technically possible use coconut sugar. They don’t use milk products so all Bennetto products are suitable for a vegan diet. Who doesn’t need a new planner every year? And what’s better than a planner or a notebook with a conscience? Every purchase of a diary, planner or notebook from Frank gives back to children in need. A great gift to make anyone smile - sweet treats and a fun bag of "throw and grow" (very cool!!) seed bombs. No gardening experience required - just lob them out there and watch the wildflowers grow as mother nature breaks them down and does her thing. Seed bombs come in bee, butterfly, ladybug and healing herb mixes. Most of us would like to change this. But knowing where to start is overwhelming. Every time you buy a bottle of wine from 27 seconds, you become part of a solution in a small way. With each bottle sold, they give away 100% of the profits to help survivors of slavery. It’s a small response to a big issue, but choose it, and together we become part of the answer. CUPPACOFFEECUP is a New Zealand-made reusable takeaway coffee cup. Instead of disposing of a cup every time you have a takeaway coffee, re-use your CUPPACOFFEECUP. The idea behind CUPPACOFFEECUP was to create a reusable cup that is lightweight, has striking full colour imagery and looks and feels much like a disposable cup. To kick off the Christmas cheer Michael and his awesome elves have designed four epic Gourmet Christmas Lunches including Vegetarian and Gluten Friendly options (so nobody needs to miss out). Made with locally sourced restaurant quality ingredients, our Christmas Gourmet Lunches are delicious way to treat the team or to indulge yourself. For every Gourmet Christmas Lunch you buy, Eat My Lunch will give a lunch to a Kiwi kid who would otherwise go without. Spread the joy. Start your journey to zero waste living with The Natural Box plastic free kits. Filled with all the best plastic free products specifically chosen to make plastic free living easy, without having to cost the earth! Each kit comes packaged in 100% plastic free,compostable and recyclable packaging. Or you can create your very own natural box by choosing from Natural Box’s wide range of natural & organic products.